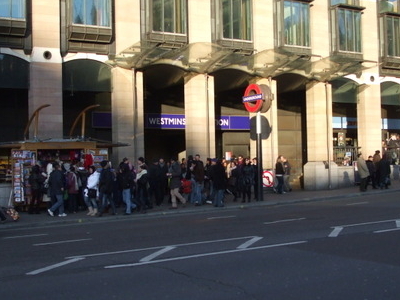 Westminster is a London Underground station in the City of Westminster. It is served by the Circle, District and Jubilee lines. On the Circle and District lines, the station is between St. James's Park and Embankment and, on the Jubilee line it is between Green Park and Waterloo. It is in Travelcard Zone 1. The station is located at the corner of Bridge Street and Victoria Embankment and is close to the Houses Of Parliament, Westminster Abbey, Parliament Square, Whitehall, Westminster Bridge and the London Eye. Also close by are Downing Street, The Cenotaph, Westminster Millennium Pier, the Treasury, the Foreign and Commonwealth Office and the Supreme Court. The station is in two parts: sub-surface platforms opened in 1868 by the District Railway (DR) as part of the company's first section of the Inner Circle route and deep level platforms opened in 1999 as part of the Jubilee line extension from Green Park to Stratford. A variety of underground and mainline services have operated over the sub-surface tracks, but the original station was completely rebuilt in conjunction with the construction of The Deep level platforms and Portcullis House which sits above the station. Here's the our members favorite photos of "Metro Stations near City of Westminster". 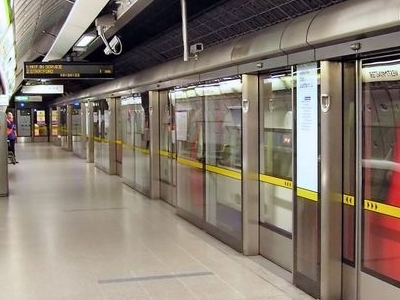 Upload your photo of Westminster Tube Station!